Of course, the first iPhone App I need to write about is the TypePad app. Setup was easy, just enter my user name and password (though it asked for my email as username when I instead have a regular user name). 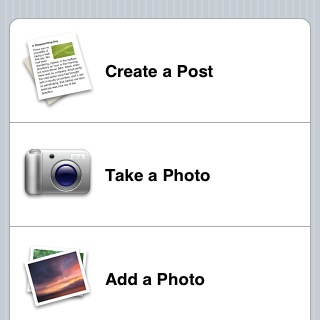 Once setup you can start a new text post, take a new photo, or start a post from your photo library. Once the post is started you can add more photos. Unfortunately, if you are interrupted, the message you are in progress is not saved in drafts. One nice bonus feature I didn't expect was Twiiter integration, which I am testing with this post. No editing of existing posts, and no rich text, but still seems a useful app. Probably a keeper.